An interesting dice game with dozens of awards and achievements to be earned. Time to get rolling! Start your very own record shop with the goal of becoming the wealthiest person in Rubato Hills. Click your way through space! Upgrade your rocket and see how fast you can make it. Help a virus rise to dominance by taking over all the rival cells in each level of this Virus Wars level pack. Play as a dolphin an entertain your audience by performing various tricks. You are in charge of running Papa's Pancakeria! Prepare and serve pancakes, waffles and French toast in order to satisfy your customer base. Ever wonder what it is like to run your own game studio? Hire staff, develop games and work to build the best game studio around. A turn-based RPG where you play as a young dragon-boy on a quest to defeat an evil witch. Recruit allies on your mission to save the world. Do whatever it takes to protect your carrot in this colourful (and somewhat offbeat) tower defense game. Breed and craft a team of monsters and send them into battle! Will you be able to lead your team to victory? Run your own burger restaurant! Take orders, cook and stack before serving the burgers to awaiting customers. Run your very own ice cream shop on a relaxing tropical island. Well, relaxing at least until boat loads of customers arrive. Good luck! The ultimate upgrading game is back for a sequel. Prepare to upgrade everything (and yes I mean everything!). Overpower the enemy microbes as you work to take control of every level. Train your animal and compete in races in your quest to escape from a remote island. 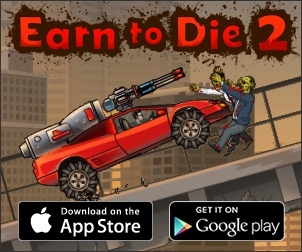 Step into the shoes of a heroic zombie, Sonny, as you fight to stay alive in a cruel and twisted world. A supermarket-simulator where your goal is to become a millionaire! It is advised you read the in-game instructions before playing. Bash your way through three pi�atas in the quickest time possible. Collect candy, unlock upgrades and destroy those pi�atas! Adopt and train a pet monster. Battle other monsters and compete in tournaments to become the world's best monster trainer! A nifty gadget which allows you to create your very own robots. Help your team complete each mission by purchasing and sending them upgrades. In a land divided by civil war, it is up to you to decide which faction you will aid. If you enjoy trading-card games you will definitely enjoy Monster Master! See instructions before playing. A time-management game in which you must run a restaurant and serve your zombie customers food� or risk becoming their food. Command your race through 25 epic battles in your quest to conquer land. Create a party of up to four heroes from five distinct character classes in this party- based dungeon crawl tactical RPG. Prevent enemy hoards from stealing your gems by building creature lairs, traps and by fighting them off yourself! An expanded version of Monsters' Den, featuring new classes, monsters, items, quests and a shop! A turn-based strategy game inspired by the popular Advance Wars games. BURGER RESTAURANT 2 Run and manage your very own Burger Restaurants - this time featuring three brand new restaurants you must run and maintain. A single player card game in which you must battle against the Cthulhu mythos. Have you got what it takes to run your very own pizza business? Create your own fireworks show! If you are having troubles, see 'help' in game. You are the CEO of an oil company. Your goal: profit! Prepare to sink battleships in this modern-take of the classic Battleship game. Overpower enemy cells to take control of each level.